today I finished watching a documentary about Donald McCullin. The documentary is called "McCullin". It took me three days to watch it til the end. During watching it and in the end I was really touched. Born on October 9 1935, McCullin grew up in Finsbury Park, north London. After a period of national service in the Royal Air Force, where he was a photography assistant, he spent his life savings on a camera. His first published photograph was of his local gang, the Guvnors, printed in the Observer in 1959. He subsequently covered the famine in Biafra, the Vietnam War, the Troubles in Northern Ireland, as well as conflicts in Uganda, Lebanon and El Salvador. In 1977 McCullin was made a Fellow of the Royal Photographic Society; in 1993 he became the first photojournalist to be awarded a CBE. McCullin lives in Somerset with his wife and youngest son. Don McCullin worked as a war photographer for the Sunday Times and what he saw through his camera was just totally shocking, but he took his photos with so much humanity and often dignity of man. His expression of his experiences can just make you cry. I am still really touched and really out of words. It is hard to say at this point that Mr. McCullin made great other photos too, not only war photos, all with impact and genius skills. Here is a trailer to the movie - please be aware that the content of this documentary shows the naked truth and madness of warfare. 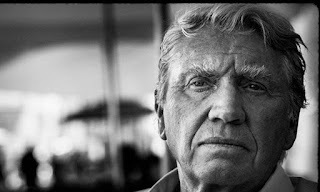 Also you can find more on Don McCullin's Wikipedia entry. And if you are interested in seeing some more of his photos and read his words check this link. Well, I am out of words now.